19th Century Irish Landscape Painter. Biography & Paintings. One of the most respected Irish landscape artists of the early 19th century, James O'Connor exemplified the fate of a number of hardworking painters whose artistic skills and successful exhibitions nevertheless failed to secure them a comfortable existence. Most of his work was in oils although he also produced a number of fine watercolours. He exhibited at both the Royal Hibernian Academy in Dublin and the Royal Academy in London, and his works are represented in a variety of public and private collections including: the National Gallery of Ireland, Fitzwilliam Museum Cambridge, British Museum, Victoria and Albert Museum, and Nottingham Museum. He was born in Dublin, the son of William O'Connor an engraver and print-seller. Apart from a few drawing lessons he received from William Sadler, O'Connor was self-taught as an artist. His early works were views of the Dargle. In 1809 he started exhibiting: his first offering being an oil sketch Card-players at an exhibition held at the Dublin Society's House in Hawkins Street. He continued to exhibit there until 1821, showing mostly landscape painting. In 1810, he published three figurative etchings. In 1813, he set out with two artist friends George Petrie and Francis Danby (an ex-pupil) to view the 1813 Royal Academy Exhibition in London. Lack of money made their stay a short one. While Petrie returned to Ireland, O'Connor and Danby travelled to Bristol where they arrived penniless. Fortunately, Danby sold some paintings to enable O'Connor to return to Dublin where he settled down as a landscape artist, painting the scenery of Wicklow and the outlying areas of Dublin. In 1818 and 1819 he travelled to the West of Ireland where he painted a number of local landscapes for Lord Sligo and Lord Clanricarde. However, despite a great deal of hard work he struggled to earn a living, in Ireland. Recently married and keen to improve his prospects, he left Dublin in 1822 and went to London. Almost immediately he succeeded in exhibiting at the Royal Academy (RA), and sold some works. He continued showing at the RA and the British Institution until 1840 and also at the Society of British Artists of which he was a member. He exhibited only twice at the Dublin Royal Hibernian Academy, in 1836 and 1840, although a number of his works were shown there in 1842 and 1843 after his death. In 1826, he went to Brussels for a year and sold quite a number of his pictures. In 1832, he spent 8 months in Paris before setting off on a tour of France and Germany, during which he became friends with the German Romantic landscape painter Caspar David Friedrich, and produced some of his finest work. Returning to London in late 1833, he worked incessantly but with disappointing results. Within a few years his eyesight began to show signs of weakness and in 1839 his health failed. He died in humble circumstances in Kensington, three years later. Walter Strickland described O'Connor as a painter of deep feeling. "His landscapes are solidly and vividly excuted and are good in tone and colour. Good drawer of wild scenery and richly wooded landscapes, often with early morning or moonlight effects in which he excelled. He was fond of introducing small figures in red coats or dresses into his landscapes." In 1985, the National Gallery of Ireland held a retrospective for O'Connor's landscapes, which was repeated in 1986 at the Ulster Museum, Belfast. 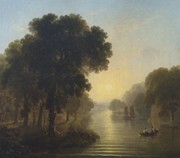 The auction record for a work by the Irish painter James Arthur O'Connor was set in 2004, when his landscape painting, entitled View on the Shannon with Figures in a Rowing Boat, was sold at Christie's, in London, for £43,020.  For biographies of other early painters, see: 18th Century Irish Artists and 19th Century Irish Artists.  For details of other landscape painters, see: Irish Artists: Paintings and Biographies.  For more about landscape painters like James Arthur O'Connor, see: Irish Art Guide.